Now supports x64 mode on 64-bit operating systems. 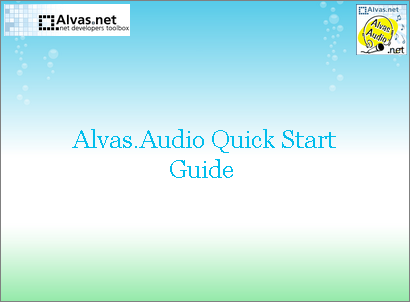 Alvas.Audio is C# audio library for .Net developers. Requirements: .Net Framework v2.0 or later (also supported in 3.0, 3.5, 4.0 and 4.6). The library allows C# and VB.Net developers to create applications that play (including mixed audio data), record, edit and convert sound. record data to any recorder installed in the system (multiple sound cards). play data from any player installed in the system (multiple sound cards). merge two mono audio streams into one stereo. Convert the audio data from one audio format to another. Convert audio wave stream to mp3 stream. Convert Dialogic .vox (adpcm) stream to Mp3 stream. Change Wave stream to MP3 stream. if Wave stream contains MPEG Layer 3 data. Play, record and convert RAW headerless format (SLINEAR etc) (used in Asterisk PBX). Play and extract audio data from Avi streams. Encode and decode Dialogic .vox (adpcm) format data (used in Asterisk PBX). View the level of the input sound signal. Whats new (version 2018.0): Improved support for mp3 format. PcmReader is wrapper around IAudioReader for reads and uncompress to PCM (Pulse-code modulation) audio data from the stream. New classes that allow you to change the parameters of audio filters in real time. CafReader class for reading audio data from CAF (Core Audio Format) streams. CafWriter class for writing audio data to CAF (Core Audio Format) streams. AiffReader class for reading audio data from AIFF (Audio Interchange File Format) streams. AiffWriter class for writing audio data to AIFF (Audio Interchange File Format) streams. Supports x64 mode on 64-bit operating systems. WaveformVisualizer draws picture of the sound amplitude-time representation (Waveform). Removes DC offset. DC offset is an offsetting of a signal from zero. Occurs when hardware, such as a sound card, adds DC offset to a recorded audio signal. AuReader reads an audio data from the .AU and .SND streams. ToFormat method converts audio data to the specified audio format. Normalize method raises the volume so that the highest sample level reaches a maximum level. Inverts the audio signal to 180 degrees. All positive values in the wave form are replaced by negative and vice versa. Frees memory previously allocated for audio format. Creates 32-bit IEEE Float audio format. Performs resampling audio data from and to 8/16/24/32-bit integer PCM and 32-bit IEEE Float audio formats. Support audio filters such as Chorus, Compressor, Distortion, Echo, Flanger, Gargle, I3DL2Reverb, ParamEq, WavesReverb. Helper for decoding audio data in PCM (Pulse-code modulation).